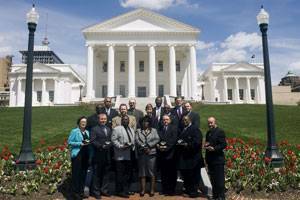 The shipbuilders of Northrop Grumman Corporation (NSYE:NOC) were honored by the Virginia House of Delegates during a ceremony held on April 8 at the start of the Reconvened Session. The 2009 General Assembly adopted a resolution commending the employees of the company's Shipbuilding sector on the completion of the USS George H.W. Bush (CVN 77), the 10th and final Nimitz-class aircraft carrier built in Virginia. During a ceremony on the floor of the House of Delegates, the final signed copy of the resolution was presented to a delegation of shipbuilders who worked on USS George H. W. Bush and other ships in the Nimitz class. The resolution, sponsored by Delegate Glenn Oder of Newport News, was adopted unanimously by both the House of Delegates and the State Senate. Commending the shipbuilders of Northrop Grumman Shipbuilding. RESOLVED FURTHER, that the Clerk of the House of Delegates prepare a copy of this resolution for presentation to the shipbuilders of Northrop Grumman Shipbuilding as an expression of the General Assembly's gratitude for the shipbuilder's many contributions to the nation's defense and best wishes for continued success in the future.